I remember, as a child, loving the sounds of “The Click Song”. For a white South African, the various clicking sounds so typical of the Xhosa language, are incredibly difficult, if not impossible to emulate. That never stopped me from trying. If you ever had to hear me contort, abuse and strangle the wondrous sounds of one of your most iconic songs, you would have wept. but I think you would have been proud, as well. Your music represents a bitter-sweet era. When I listen to you sing, I imagine myself in the hustle and bustle of Sophiatown in the fifties and sixties. Kwela and pennie whistles. Mielies and paraffin heaters. But I never forget that for many years, you were denied access to the sights and sounds and smells of our beloved country. In my mind, because of this, and because of your stature, and your dignity, I often seat you next to Celia Cruz at the dinner table of my mind. I am just glad that you, unlike Celia Cruz, had the opportunity to return home, and to treat us to your copper voice on South African soil. And I think you would have been filled with an inner satisfaction that, though you had to die in a foreign land, you died after having done what you so loved to do – sharing your soulful music with others, and in pursuit of a good cause. 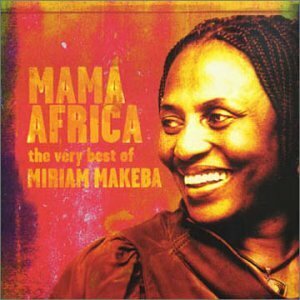 Mama Africa, you said you’d like to be remembered as a good old lady. I am sorry, but in my mind’s eye you will forever dwell on the good side of 50, and therefor the best I can do, is to say you were a great lady. You, like your music, can never be old. Thank you for the music. Hamba kahle, mama. Africa, my home, my birthplace. Even though thousands of kilometres separate us, you are always with me, in me, my heartbeat, my breath, my sorrow, my joy. You are like a violent husband: I am better off without you, but my heart won’t stop yearning. I rant against your indiscretions, your temper, your fists, your insults, wishing to be rid of you. And then I cry, and crawl back, asking your forgiveness, trying to see where I’ve failed you. One kind word, act from you, and I forget the countless humiliations, bruises you bestowed. And I continue to live with the dichotomy, every time I see the evidence of your excesses and abuse, or your compassion and creativity. It is just that, as time goes by, that I see more and more of the former, and less and less of the latter. Is it my heart growing darker, or yours? I’m not voting.Here is my proxy vote – use it wisely. For almost two years the world, well OK, I, have closely observed the wheeling and dealing, the shaking and stirring, the positioning and the posturing of US politicians, vying for the position of the most powerful leader in the world. From the beginning, the Republican stable was uninspiring, bland, and predictable. It was the Democratic hand that excited and inspired from the word go: John Edwards, with his passion for the working classes, Barack Obama, young, energetic, and African-American, literally, and Hillary Clinton, the dynamite woman of politics. Even then, the themes of change and experience rang clearly through all the speeches and advertisements. Now, it’s whittled down to 2 choices. (Well, sorry, independents, in 2012 I’ll pay more attention to you guys, and I do think the USA do you and the people a great disservice by ignoring you so much.) But today, less than an hour before the first polling station opens, I want to stick to the two main players in the race. If you have read my previous posts, or you know me, then you know where my support lies. At first I was really torn-up with the choice between Hillary and Barack, but once that was resolved, my position was clear. Unequivocally, I support Barack Obama. To a large extent it was a knee jerk choice, but I hate those, so today, I want to analyse and motivate my choice to myself, and to you. On the topic of associations, again, for every dubious association of Obama’s, you can dig up one (or more) for McCain. Ex-domestic terrorist for ex-domestic terrorist, controversial pastor for controversial pastor, corrupt businessman for corrupt businessman. McCain can even trump with some mob connections, and communist military dictators. But who’s counting? So yes, Senator McCain, you have been tested, but no, you did not, in fact, pass the test. Any of them. Not the ones that matter here and now, at any rate. But Senator Obama did. After one debate, the second. I think, Obama was criticized for frequently agreeing with McCain, or affirming his positions. The McCain campaign even tried to exploit it in their ads. I saw it as an example of Obama’s statesmanship, managing to reach across the aisle, something McCain constantly claims as his trademark. But while McCain tells, Obama shows. And how does McCain treat it? With ridicule, and trying to manipulate it for his own purposes. In fact, throughout the campaign, while Obama did not hesitate to take McCain on on issues, he always praised and honoured him for his service to the country. McCain, on the other hand, regularly treated “that on” with contempt. Overall, I am less than impressed by McCain’s unpredictable, at times grumpy, erratic, full-of-energy-today, out-of-steam-tomorrow, doddering demeanor. I am bowled over by Obama’s calm yet energetic, nerves and spine of steel, caring image. I don’t like McCain’s tough guy, brawny behaviour. Nobody expects him to go and fight a war, that’s what the army is there for. I’ll take Obama the brain, who will diplomatically and strategically try to avoid conflict, and if it won’t be avoided, he can use his intellect to wisely direct the army. Because that is what one expects a president to do. Not to physically lead the charge on the battleground. On the issue of first lady, the intelligence, humility, charm, grace and poise of Michelle Obama is extraordinary. Enough said. As a South African, how is this any of my business? Because America is a city upon a hill. At the moment, the name of that city is Mordor. I don’t expect Obama to work miracles, but even if he just butts out of everyone else’s business, that will be an improvement. If he changes and improves the way the USA interacts with the world, it will be a boon. I look forward to more caring, and less greed. More talking and less threatening. More friendship, and less parenting. And there is always the slight possibility that he’ll change the city into Shangri-La. Now as I, disenfranchised citizen of the free world, cannot vote in this election that will impact on the whole world, I give you my proxy vote. Please use it. Get out there and go vote! Don’t get it wrong again, America. The cross goes next to Obama!